Russian President Vladimir Putin, left, and U.S. national security adviser John Bolton meet in the Kremlin in Moscow, Oct. 23, 2018. Bolton called Russian violations "long and deep." "The threat is is not America's INF withdrawal from the treaty. 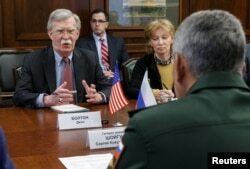 The threat is Russian missiles already deployed," Bolton said. "The American position is that Russia is in violation. Russia's position is that they are not in violation. So, one has to ask how to ask the Russians to come back into compliance with something that don't think they are violating." Bolton told reporters after the talks that formal notice of a withdrawal would be filed "in due course." Russia's Defense Minister Sergei Shoigu, back to camera, meets with U.S. national security adviser John Bolton in Moscow, Oct. 23, 2018. "On the coat of arms of the United States, there's an eagle holding 13 arrows in one talon and an olive branch in the other," Putin reminded Bolton. "My question is whether your eagle has gobbled up all the olives, leaving only the arrows." In more serious remarks, a Kremlin spokesman said a U.S. pullout from the INF Treaty would make the world a more dangerous place, and Russia would have to take security countermeasures to "restore balance." The last meeting between Trump and Putin in Helsinki in July turned out to be a bit of a domestic disaster for Trump. At a post-summit joint news conference, he appeared to accept Putin's denials of Russian meddling in the 2016 U.S. election, contrary to the findings of U.S. intelligence agencies. U.S. national security adviser John Bolton, left, and U.S. Ambassador to Russia Jon Huntsman attend a flower-laying ceremony at a World War II monument in Moscow to commemorate victims of a recent attack on a local college, Oct. 23, 2018. 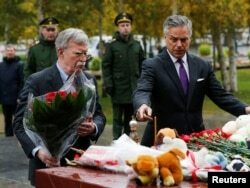 Bolton also laid three separate bouquets of flowers during his visit to Moscow — the traditional wreath at the World War II Memorial by the Kremlin wall; flowers to remember the victims of last week's massacre of college students at the Black Sea port of Kerch; and flowers at the site near the Kremlin where Russian opposition leader and Putin critic Boris Nemtsov was gunned down in 2015.